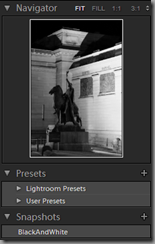 In a single step the Snapshotter plugin creates snapshots of the current develop settings for all selected photos. Snapshots capture a permanent record of an image’s current develop settings and can be accessed from the Snapshots panel on the left hand side of the Develop module. The trial version operates on up to 10 images at a time. Donating to the plugin via the Photographer’s Toolbox will give you a registration code that will remove this restriction. All future updates are free. This plugin is a lifesaver! I was looking for this exact feature. Thanks! @Brian, Glad you found it useful. How are you applying it to your workflow? I’m looking for a way to replace a functionality present in an early beta version of LR that they dropped for some reason–when I create a new snapshot I want the snapshot name to be automatically populated with the current date and time, rather than the unhelpful “Untitled Snapshot-1”. Can your plugin do something like this? if not, could it possibly in the future? @Jonathan, It doesn’t do it yet but I am planning to add many more variables for use in naming so it is definitely on the cards. I’ll see if I can make some progress on this soon. This is exactly what I was looking for, thanks. I’ve had a few issues with it crashing Lightroom when applying to large numbers of images (I’m snapshotting all my images before switching to the new LR3 processing engine). All seems good though. @James, sorry to hear about the crashes. Obviously this should not be happening, and it should not be possible to crash the product via the SDK, so I might add some sort of throttling mechanism to work around the bug. What Lightroom version are you using (3, 3.2 RC or 3.2?) and are you a Mac or PC user? Approximately how many photos were you creating snapshots when it crashed and did you find a relatively safe batch size that wouldn’t crash? This would help me pick a number of snapshots to create before introducing some form of safety mechanism. I’m not certain whether the cause of the crashes is your plugin or Lightroom itself. In the first instance I selected LOTS of images and created a snapshot… after not that long Lightroom stopped responding and when I ran it again I found not that many images had a snapshot created. The second time I selected a smaller number of images but the same thing happened. I then launched LR again, and noticed that my photo disk was going crazy as LR wrote changes to XMP… I waited and LR crashed on its own (I didn’t re-run the plugin). I then relaunched LR yet again, my disk was still going crazy, and then eventuall yLR seemed to update all the images I’d changed in attempt two and they now have snapshots. Since I have LR configured to write changes to XMP automatically, and since LR crashed once when I didn’t interact with the plugin at all, I’m thinking the issue was actually just LR crashing due to extreme writing to XMP. This was with LR3.2 (full release, not rc). @James, That is rather interesting and it does sound like Lightroom had an issue rather than the plugin directly. That said the sheer volume of changes that can be generated by the plugin can’t help so I might still provide some way to throttle this. This might have to be a manual option end users can configure. Out of curiosity what size are most of your images (how many Mbs), which of raw or DNG or JPEG are most of your photos, what platform do you use, and what real time virus scanner do you use on that system? Also do you use disk encryption or a desktop search engine? I’ll report this issue to Adobe and all of these factors will contribute to how much disk contention will interfere with Lightroom writing that information to disk. Good work, I use a few months ago and this plugin is a great lifeline. It could be added in a futur version, a check box to clear the history after the creation of the snapshot? @Seb, Thanks! Unfortunately the official SDK doesn’t give me a way to do that. I will add it to my feature list in case this ever becomes possible though. I’m running LR 3.2 x64 on Win7 x64. No disk encryption and whilst Win7 has a built in search engine I am not indexing the image folders (but maybe it’s indexing the Lightroom previews? will check). Image wise it’s a bit of a mix, I’ve got ~4000 JPGs from a Canon S1is (~1MB each), ~5000 JPGs from a Canon 350D (2MB-5MB each), ~3000 JPGs from a Canon 40D (2MB-5MB) and ~8000 RAWs from the Canon 40D (~12MB each). I initially selected all ~20000 images and used the plugin (probably overly optimistic). This crashed and seemed to only have written to the first few thousand… LR did not seem to be attempting to access my disk so I narrowed my selection to only the RAW images (the ones I most wanted to protect anyway) and applied the plugin just to those 8000. After a little while LR crashed again but this time when I restarted it it continued to write changes to disk. Interestingly, when I restarted LR and checked the status of my images it said it had NOT created a snapshot for most of them, but then continued to update them in the background and when I checked later they did have snapshots. LR crashed again without my interaction while it continued to write changes to disk so I relaunched yet again and this time it seemed to complete fine (some time later). As far as I can tell all 8000 images have a snapshot but obviously I haven’t checked every one individually. It’s odd that LR crashed while writing changes to disk even though the “changes” weren’t being displayed within the LR GUI (ie the snapshots didn’t appear to exist). I guess this leaves open the question of whether the crash is caused by the API calls stacking up or the writing to disk overloading. Another quick update. If it wasn’t already clear I have “Automatically write changes into XMP” enabled (I know this slows things down but I’m more interested in protecting my changes than LR being snappy). I also checked and the Lightroom previews folder was being indexed by my Win7 indexer. I doubt the previews were actively involved in the snapshot process, but even so this would seem like a bad idea and I’ve removed the Pictures\Lighroom folder from the indexer. Certainly is great to be able to create Snapshots for multiple images. Thanks a lot! I have a question, would it be possible to implement a feature that works un the other direction? What I mean is to delete a specific named snapshot for multiple images. Due some issues with my HD and my Catalogue conversion from LR2 to LR3 I had to re-import the images on LR2 and now I end having “Import 2” and even “Import 3” Snapshots in all my pictures. @Mario, Unfortunately we haven’t been given access to the ability to delete snapshots (though I did request it) so we might have to wait till LR4 before I can deliver upon that particular feature request. The published SDK only provides access to snapshot creation at this point in time. I do have a few additional features I am planning to add that might work around some of those limitations, but I can’t work my way around the lack of a delete function. The reason we want this? Relatively speaking, it takes a lot of time to create a snapshot of several images. If (as in my situation) a person is editing several 5 shot auto bracketed images to be used for HDR there are some edits such as spot removal (Dust spots) that are performed by selecting each 5 shot group of images and using Sync to remove the dust spots on all 5. At the moment this step is performed all 5 images of the Synced operation are still selected. It would be a big time saver to have the ability to do a snapshot of all these images at one time. I consider my “Dust Spot Removed” snapshot important in this example, because that is the first stage of edit for these images that I want to use as a initial point of reference before other edits. In this scenario; you may have removed the dust spots from 100 images and want to select all, then apply a snapshot. I can think of several ways it would work well. I think it would be cool to be able to apply a pre-named snapshot to your images at any point via the painter or via dragging and dropping either the selected images to the snapshot or vice versa. I will get this installed and if it works as it seems I will be happy to “Buy you a beer or a coffee”… I’ll donate. @Bud, I’m glad this fits your workflow – the scenario you describe sounds like a good fit for the plugin. And thanks for mentioning that Ian sent you in my direction. The plugin will automatically remember the last snapshot name you used so that should save you some time. Having naming presets is a feature I want to add but have a few other plugin development tasks I’m trying to complete first. The painter or dragging and dropping images (or vica versa) features are not currently available to plugins. If you are on Windows you can use keyboard shortcuts to access the plugin though. I only recently found out I couldn’t make snapshots of multiple images at once and thought this would be a very good feature as I often re-edit images days, weeks or even months after finishing an edit. I’m sure that I’ll use it once I get to grips with it. @Matty, Thanks for the feedback and letting me know how you found out about the plugin. Be sure to let us know if you have any questions about its usage or anything else you’d like to share. Hi Matt, For reasons not important I never installed until recently, but I am really enjoying your awesome plugin! It’s so great to be able to create multiple snapshots and do it from either the Library module or the Develop module. In a previous reply you mentioned what I was planning to ask about where you said; “Having naming presets is a feature I want to add but have a few other plugin development tasks I’m trying to complete first.”… That is a great idea and is one I would really appreciate. It is cool that the plugin remembers the last snapshot name, but to promote consistency in names and keep things clean, it would be nice to have a drill down list of saved user assigned snapshot names such as “Original”, “Dust Removed”, “Processed”, etc. I will be happy to do an extra followup donation if (when) we get the ability to add saved user names for our snapshots. @Bud, Thanks for the kind words both here and on Lightroom Forums. Much appreciated! As you’ve noted I haven’t added that feature yet. In fact Snapshotter hasn’t really received much attention in a while, partly because there hasn’t been much feedback around it. Now you’ve reminded me of this feature request I’ll see what I can do. Thank you Matt, I am really surprised about what you said “In fact Snapshotter hasn’t really received much attention in a while, partly because there hasn’t been much feedback around it.”… I mean I am surprised that Snapshotter has not had much feedback. The reason for my surprise is that Snapshotter id one of the most needed and most useful plugins I know. Aside from the obvious usefulness of what I call “Bulk Snapshot” ability to apply snapshots to multiple photos at once. The most important aspect is the time saved when using it to essentially “Lock” a group of imported or edited photos by adding the protection of saving a desired edited or original state in case the photo gets accidentally altered. Some might wonder how an accident could occur, but they will soon learn the first time they forget to disable or turn off Auto Sync or don’t notice that more than one photo was selected when they make an edit. I am really surprised Adobe has not implemented a “Lock” feature yet, but your Snapshotter has saved me… Thanks! @Bud, I’m glad you are finding it useful and hopefully when I get that feature added it will help drum up a little more attention for the plugin. Also thanks for pointing out those forum posts I had missed. I’ve updated my Google Alerts so I’ll catch more like those in future. Those threads are great for generating ideas for new features for plugins. Hi, I use your plugin all the time. Thanks. There is one enhancement that I think would be useful and that is the ability to save several presets for the snapshot name format. I take snapshots for several different reasons and I have to remember to edit the Snapshot name each time. @Louie, I’m working on an update right now. Keep an eye out for it early in the new year. “I’m working on an update right now. Keep an eye out for it early in the new year.”…. Yay!!! @Bud, Why am I not surprised to see a comment from you?!? 🙂 Sorry it has taken so long. I’ve released a new version of Snapshotter which should address the most common feature requests and issues mentioned in the comments. It adds the ability to create snapshot naming presets, and improves the speed and robustness when creating large sets of snapshots. Hi Matt, I have an idea & request for the Snapshotter plugin if it makes sense to you and isn’t too difficult to implement. I would like to see the snapshots be in chronological order rather than alphabetic order. I often end up with many snapshots on an image of various stages of edit as well as virtual copies of different versions of an image. Since the snapshots names are often different I find they get jumbled up and I usually have the need to dig out the latest to the newest versions. When there is more than 4 or 5 it gets to be disorderly from a chronological view. I think it is most useful when the snapshots line up chronologically like the history does. Thanks much for the upcoming update! @Bud, I can’t change the order in which the snapshots appear. But you can choose a snapshot naming scheme that is prefixed with a date, which will hopefully achieve the desired result. The comments feature should be working again now. Apologies to those who have entered comments and had them lost by the system. Matt, Thanks so much for the version update. Awesome plugin. Been using this for LR4/5 – any ideas about updating it for LR6/CC? @JF Unson, the plugin still works with LR6/CC and has recently been updated. Was there something in particular you were commenting about? Thank you, Matt! Was waiting for the update – the 1.05 wasn’t working. @JF Unson, One of the 6.x minor releases introduced an unannounced code change that broke existing plugin code that had been working fine for years. I wasn’t the only plugin developer impacted. Thankfully someone reported the issue so I could resolve it.